» Five Huge NHL Moves You’ve Probably Forgotten: Part 2! Five Huge NHL Moves You’ve Probably Forgotten: Part 2! Strange moves from NHL history that probably seemed like a good idea at the time. Back in November, we took a look through the history books at five mostly forgotten transactions that inadvertently helped shape the NHL we know today. It was a fun post, and I’d like to think we all learned something. Like how the Vancouver Canucks scammed the whole league to draft Pavel Bure one year early, or how the Flames once traded up in the draft just so they could pass on Martin Brodeur. And, most importantly of all, we learned that you should never, under any circumstances, trade for Viktor Kozlov. Seriously, that guy ruins everything. Well, now seems like a good time to dive back into the pile of forgotten transactions. So here are five more strange moves from over the years, all of which probably seemed like a good idea at the time. 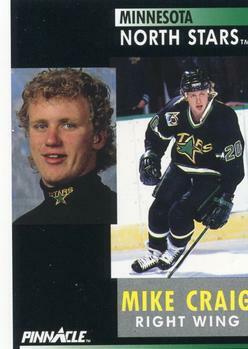 Craig was a winger who played seven full NHL seasons in the 1990s. Here’s everything you need to know about him: good junior player; second-round pick; interesting hair; marginal NHL bust; irrationally hated by Maple Leaf fans for costing them Peter Zezel; the end. Oh, and he’d also end up being personally responsible for a ridiculous number of star players winding up in San Jose. And all because — more than two decades ago — the Sharks agreed to not have him play for them. Strap in, this one gets kind of convoluted. In 1991, the Sharks came into existence as a quasi-expansion team that was partially split off from the Minnesota North Stars because of a complicated ownership dispute. That led to a dispersal draft in which the Sharks stocked their roster with North Stars players, followed by an expansion draft in which both teams got to pick players from around the league. Absolutely nobody understood how any of this worked at the time, but we didn’t have the Internet so we just went with it. The North Stars had drafted Craig two years earlier, and he’d played 39 games for them in 1990-91. He wasn’t protected, but Minnesota still wanted to keep him. So they worked out an arrangement with San Jose: In exchange for a 1992 first-round pick and a 1991 second-rounder, the Sharks agreed that they would not draft Craig. It would end up being one of the greatest deals the team ever made. Those two draft picks ended up being Sandis Ozolinsh and Andrei Nazarov, both of whom were productive players for San Jose who had long NHL careers. But it was the chain reaction of deals that flows from both guys that is still being felt in San Jose today. Ozolinsh was eventually traded for Owen Nolan, who scored more than 200 goals for the Sharks before being dealt to Toronto in a lopsided 2003 deal. Meanwhile, Nazarov was dealt to the Lightning as part of the Vincent Lecavalier deal we talked about last time. That deal got the Sharks Bryan Marchment, who begat Matt Carle, who begat Dan Boyle and also landed San Jose with two more picks, who became Brad Stuart and Jonathan Cheechoo. Cheechoo scored 56 goals and won the Rocket Richard Trophy in 2006, before being traded as part of a package for Dany Heatley, who was traded for Martin Havlat. And Stuart was a key part of the 2005 trade that brought Joe Thornton to San Jose, where he won that season’s MVP. So 200 goals from Nolan, a Rocket Richard, a Hart Trophy, and a roster that to this day still features Havlat, Boyle, and Thornton … all in exchange for not taking Craig in a dispersal draft more than 20 years ago. It’s no surprise that, even to this day, San Jose Sharks fans still sing the praises of one of the most beloved and influential players in franchise history: Not Mike Craig. Selanne’s 1992-93 rookie season is one of the most amazing years in NHL history. He shattered the rookie scoring record, finishing with 76 goals and 132 points, and was an easy choice to receive the Calder Trophy as rookie of the year. While that rookie year would end up being the only full season he’d play in Winnipeg, to this day, he’s quite possibly the most popular player in the history of the franchise. Which is why it might surprise you to learn that Selanne didn’t sign his first NHL contract with the Winnipeg Jets. He actually signed with another Canadian team: the Calgary Flames. 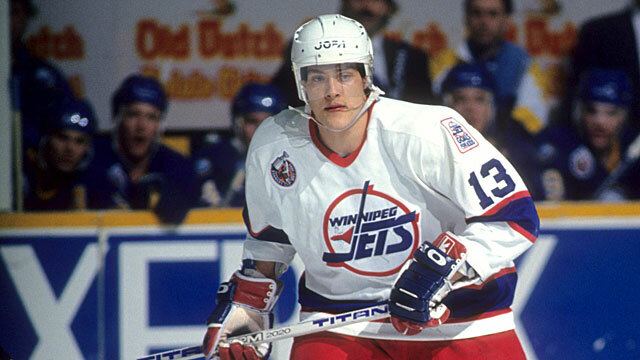 The Jets had drafted Selanne in 1988, but still hadn’t managed to sign him when he decided to finally make the jump to North America four years later. Because of the league’s rules for drafted-but-unsigned European players, he was considered a restricted free agent. Any team could sign him, but the Jets would be given an opportunity to match. The Flames pounced at the opportunity, presenting Selanne with a deal worth far more than anything the Jets had been willing to offer, including a then-massive $1.5 million bonus. He signed the offer sheet, and for a time, it seemed like the Jets would let him walk. Eventually, they did match the offer and retain Selanne’s rights, though they weren’t exactly happy about it. Although it’s hard to imagine now, there was a time when the Flames’ offer sheet led to some bad blood between Selanne and Winnipeg fans. After all, who was this greedy Finnish kid who thought he deserved almost as much as Wayne Gretzky before he’d even stepped onto NHL ice? He’d better be worth it. He was, as an 11-goal October proved. By March, he was doing this and all was forgiven. Two decades later, Selanne is still in the league, and still a hero in Winnipeg. The offer sheet has never been spoken of by a Jets fan again — except when they want to make a Flames fan cry. Let’s say it’s the 1993-94 season and you’re an NHL general manager. Who would you rather have: Marty McSorley, or Shawn McEachern? If you’re not sure, don’t worry. The Penguins and Kings couldn’t figure it out, either. Late in the 1993 offseason, the Kings sent veteran defenseman McSorley to the Penguins in a straight-up deal for McEachern, a forward coming off a 28-goal rookie season. For whatever reason, the deal just didn’t work out for either side. McEachern only managed eight goals as a King, and McSorley never looked right in a Penguins uniform (well, at least when he wasn’t fighting Bob Probert). So Pittsburgh and Los Angeles did the only reasonable thing: They asked for a mulligan. In February, the two players were traded for each other again, this time in a deal that also involved Tomas Sandstrom and Jim Paek. Neither reunion lasted very long — McEachern was traded again by August, this time to the Bruins as part of a Kevin Stevens–Glen Murray deal that ended up being quite the blockbuster in its own right. Meanwhile, McSorley lasted just more than a year in L.A. before being sent to the Rangers in a seven-player deal that landed the Rangers future Hall of Famer Jari Kurri. Kolzig waited 20 years to be involved in his first NHL trade. It probably didn’t work out quite the way he thought it would. Kolzig was a goalie who was drafted by the Capitals in the first round of the 1989 entry draft. He stayed in the organization for 19 years and more than 700 NHL games, and holds just about every career mark in the franchise record books. But when the team decided to move on after the 2008 season, Kolzig wasn’t quite ready to hang up his pads. So he signed with the Lightning for one season. It would be his last — he suffered a serious arm injury after playing just eight games. By December, he was on injured reserve and his career was essentially over. All of which made it a surprise when, at the 2009 trade deadline, he was traded to the Toronto Maple Leafs. When the deal was announced, a confused hockey world tried to figure out what was going on. Had there been some sort of mistake? Did the Leafs not know he was hurt? Had a frustrated Brian Burke finally snapped and decided that an injured and basically retired goalie would still be an upgrade over what he was stuck with at the time? None of the above, as it turns out. Burke was just working the system. The Leafs acquired Kolzig as part of a package deal (there were other minor pieces going each way) knowing full well he’d never play for them. But the injured goalie was still owed hundreds of thousands of dollars, and the Leafs agreed to write the checks if the Lightning threw in a fourth-round pick in the 2009 entry draft. In essence, Burke had bought a draft pick. There were reports that the league didn’t like the deal — teams aren’t supposed to be able to use cash to buy assets — but couldn’t actually find any grounds to block it in the CBA. So the trade went through, and Kolzig technically finished his career as a Maple Leaf. But justice has a funny way of being served in Gary Bettman’s world. Less than a month later, the league announced that the Leafs had been found guilty of a minor CBA violation on a contract they’d signed the year before. As punishment, they were fined and stripped of a draft pick. And in what was surely just a bizarre coincidence, the draft pick the Leafs would forfeit just happened to be the same one they’d acquired in the Kolzig deal. Lesson learned. Nobody has tried to buy a draft pick since. For a career backup guy who only played parts of five NHL seasons, Stephane Beauregard sure had a habit of being involved in weird trades. The most famous, of course, was the 1992 deal that saw the Sabres send him and a draft pick to Chicago for Dominik Hasek. Back then, Hasek was a 27-year-old rookie who was stuck behind Eddie Belfour on the Hawks’ depth chart, but he’d go on to have one of the greatest goaltending careers in league history, cementing Beauregard’s status as the answer to a common “worst trades of all time” trivia question. But if Beauregard was part of one of the most lopsided deals ever made, he also had a knack for being involved in oddly even ones. For example, the Hasek trade was actually one of three times Beauregard was traded during the 1992 offseason. He was also dealt from Winnipeg to Buffalo for Christian Ruuttu. And a few weeks later, he was traded from Chicago to Winnipeg for … Christian Ruuttu. So that was three trades for Beauregard, two-thirds of which involved the same guy and one of which involved a future Hall of Famer, and at the end of it all he wound up right back in Winnipeg where he started. Not for long, though. In October, the Jets decided to trade him again. Apparently Ruuttu wasn’t available this time, so they did the next best thing: They sent him to Philadelphia for future considerations. After the season was over, the Flyers paid off those future considerations by sending the Jets a backup goalie. By now you can probably guess who it was. Yep, good old Stephane Beauregard. He was essentially traded for himself. Beauregard played one more year in Winnipeg and was never seen in the NHL again, probably because the league’s GMs had run out of creative ways to screw with him.